Filippo Loreti's direct-to-consumer model is good for your wallet and wrist. The top 20 list of Kickstarter’s most-funded projects is a perplexing one. There’s the multi-million dollar fidget cube. Pop-culture reboots like Veronica Mars. Neil Young’s failed Pono player. Then, bringing up the rear, what’s that? 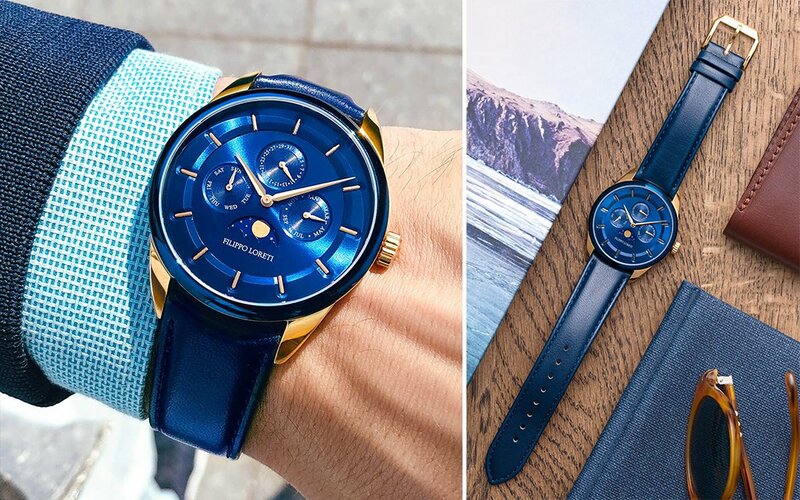 Are those legitimately good-looking watches? Your eyes don’t lie. That’ll be Filippo Loreti. If you haven’t heard the name, don’t fret: they’ve clocked fewer than five years in the horology world, which is something like two weeks in watch years (compare with Vacheron Constantin, which has been operating since 1775). But if you have, it’s most likely due to their reputation as the Harry’s, Warby Parker, Brooklinen or [choose your favorite direct-to-consumer brand] of tickers. Despite the company’s youth — and that of its 20-something Lithuanian founders Matas and Danielius Jakutis — the Kickstarter community has welcomed their campaigns with open arms. 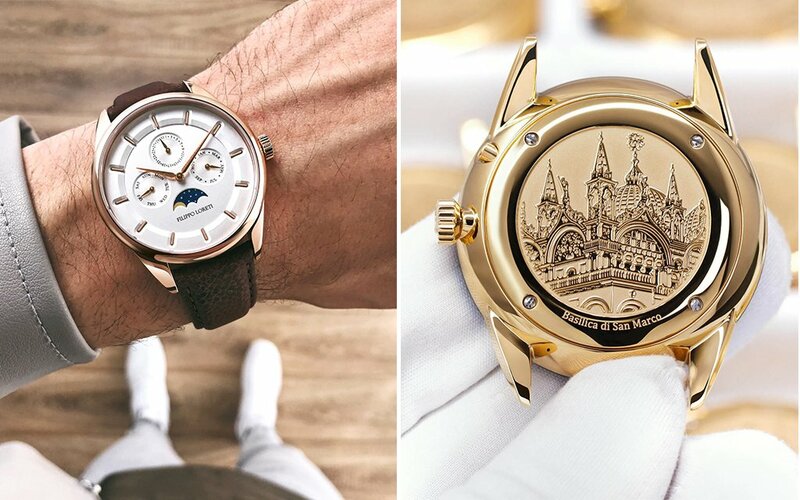 Their first, offering four watch types in November 2015, surpassed the original goal 46 times over, totalling out at €926K (roughly $1.1 million), making it the most funded timepiece campaign in Kickstarter’s history. They then blew that out of the water in 2016, with four new timepiece collections garnering a whopping €4.8 million (about $5.6 million). But to be blunt, as we have in the past when discussing crowdfunding campaigns, millions of dollars raised online doesn’t actually mean anything until you’ve got the product in your hand — or in this case, on your wrist. So we did just that. After a month of wear in the wild, here are our impressions of three of Filippo Loreti’s most popular models. First impression: I’ve never owned a watch without a second hand, so while the immaculate face offers up everything you need to know without taking your phone out of your pocket (hour, minute, month, day, date and even moon phase) — it’s also satisfyingly quiet, the minute-hand being the fastest moving piece. Also, the brown Italian leather strap and golden stainless steel case make it an aesthetically perfect pair for just about anything I wear to the office. After wearing for a few weeks: Already having my fair share of devil-may-care tickers (that is, sub-$100, nylon-strap-adorned, three-hand faces with a brand name front and center), I found the luxury-watch look of the Venice upped the ante of my daily ensembles. Wearing it with a chambray button-up and black denim, I felt on level playing field with an officemate who wears a suit with a utilitarian Apple Watch. The verdict: Ask anyone who can’t tell a $1,000 watch from a $10,000 watch (i.e., pretty much everyone you interact with on a day-to-day basis), and they’ll also guess this $249 stunner from Filippo Loreti sits in a category high above its price range. Friends are always asking: How do I step up my watch game even though I don’t have a luxury watch budget? This is how. First impression: Pulling it out of the elegantly designed box, I realized the watch — my first true mechanical — was heavier than anticipated. Not in a burdensome way; it just informs you immediately of its presence as the new occupier of your wrist. I also took note of the face: while crowded with different indicators and functions (power reserve, month dial, date window, day/night function, day-of-the-week dial), it didn’t feel overly busy. The butterfly clasp also added a touch of class. After wearing for a few weeks: Multiple people stopped me to either comment that they liked my new watch or ask where I got it. It was a hit, often eliciting the grabbing of my arm to pull it closer to their eyeballs. The initial noticeable heft seemed to melt away after a week of consistent wear. The face is a beaut to look at, with a second hand that glides along as opposed to jerking forth second by second, and the ridged case edge gave me something to rub my nails against when I had nervous energy. The singular knock is that the movement can be a bit noisy — not loud, per se, but definitely noticeable. Standout feature: It sounds like a cop-out, but I don’t think I can pick out just one. Everything works in concert, from the multifunctional face, to the alligator-stamped leather band, to the exhibition caseback and the extremely quick and easy-to-use butterfly clasp. It just feels like every part of the watch was created with every other part in mind. Throw in an automatic movement and you’ve got yourself a banger of a starter watch. 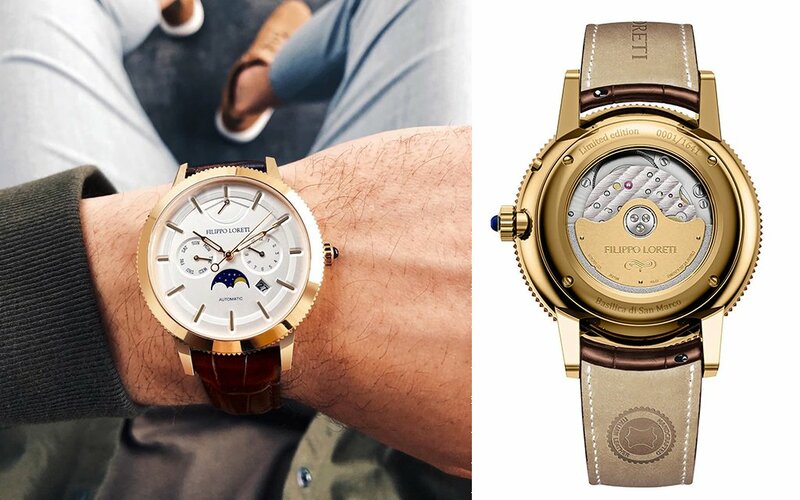 The verdict: For someone that can afford the Vacherons and Pateks of the world, this watch probably isn’t for you. But for folks who want to get a beautifully designed and incredibly affordable automatic watch, this should be top of the list. It feels great on the wrist, runs like a dream and has just enough panache to turn a few heads. After wearing for a few weeks: This watch is extremely wearable. By which I mean: lightweight and snug on the wrist, to the point that I don’t have to worry about scratching the lens on desk edges and door handles as I clumsily go about my day. I remove some of my heavier watches when I’m working on my computer; this one I left on. Standout feature: The blue strap, of course. One note, though: beware of the outfit you’re pairing it with. It adds a nice pop of color to black-and-white ensembles and seamlessly complements other blues. With an equally lurid color of shirt, though, you run the risk of coming off a bit garish. The verdict: I love the blue as a jaunty departure from my everyday watch, which is a simple, understated white face on a brown leather band. This ticker also works well for special occasions, like a date or company outing, as it’s sure to elicit a few covetous glances and hey-where’d-you-get-thats.